Brighten your decor with a splash of color! Make colorful, comfy home accents such as placemats or Jelly Roll Rugs. These projects have a nice soft feel, unlike traditional crocheted rugs. No raw, unfinished edges that can fray or catch on things. 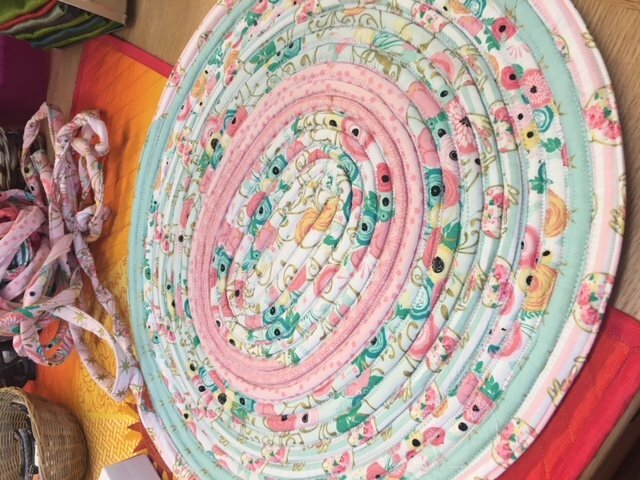 In this class, you will learn to make rolled fabric to create two types of rugs, coiled and straight line. Once you learn this fun technique, you will be able to make coiled fabric creations to your heart's content. For example, you can make an approximate 30" x 44" area rug using one Jelly Roll - (42) 2 1/2" fabric strips and two rolls of Katahdin 100% cotton batting. For this class, you will need a sewing machine in good working with a straight and zigzag stitch, 1/2 Jelly roll, or 20 strips of 2.5" fabric cut WOF 5", one roll of Katahdin 100% cotton batting and plenty of thread. *all materials are available at Maggie's Log Cabin in Longmont and students receive a 15% discount on all class supplies purchased at Maggie's. Requirements: One Jelly Roll or approximately (24) 2.5-inch strips of fabric--cut width of the fabric. One Roll Katahdin precut organic cotton batting. Sewing machine in good working order with a zig zag stitch. Lots of thread in coordinating or contrasting color. 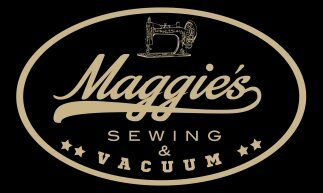 Students receive a 15 percent discount on materials for class when purchased at Maggie's. Bring your lunch or lunch money!